GMenu2X is a very very good alternative frontend for the gp2x. It supports overclocking, sound volume setting, touchscreen, etc. GMenu2X allows you to create direct links for your games & applications so that you can directly launch them without having to browse through all the filesystem manually, resulting in a better user experience. Its a little better now, the menu actually loads. However, no buttons work at all except for the touchscreen, and the calibration on it is so far off its useless (calibration on original Wiz menu is fine). 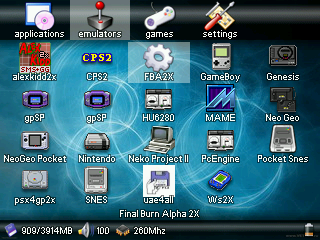 When exiting an application (gpSP), it goes to the old menu. Is this happening to anyone else? I'll download it when someone says it works. it works with the new firmware! Thx! if you start your wiz and get a black screen have you done something wrong? I don't now if it is downloading or not. Hangs at loading screen for me. Wrapper currently doesn't work on firmware 1.1.0 and games/applications exit to WiZ menu. Otherwise, excellent. @flagrant99: Gmenu2X won't work in NAND unless you follow the instructions at the developer's web site (requires some modification of WiZ defaults). I don't understand how to get my emulators in the "emulators" menu of this app. When I use the L or R key to scroll to emulators, it's completely empty. How do I do this?? I have no idea where to find the Wiz's default applications (movies, flash, etc.) when trying to make links. Could somebody help me out? Looks good, but is it possible to get back the original GPH Menu when you are done with this one?